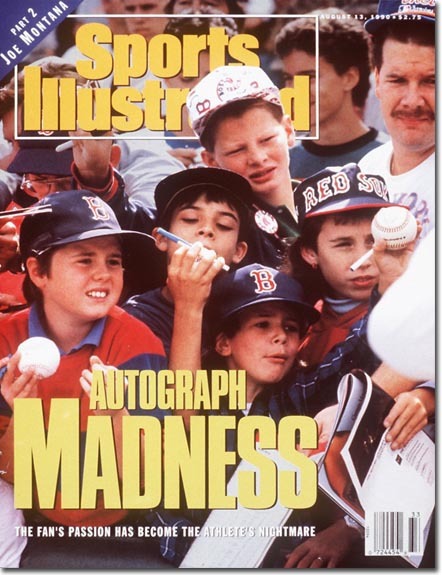 Scott Smith, a former investment banker from New Jersey, is trying to collect autographs from every person to ever appear on the cover of Sports Illustrated. Ironically, he’s having a hard time tracking down the autograph seekers in this photo. According to The Boston Globe, Smith has spoken to the photographer, Jacqueline Douvoisin, and was able to figure out when the photo was taken but not much else. He found a newspaper column from Maine that said one of the people featured died suddenly in 2008. So he turned the Globe, presumably hoping a Boston reader would recognize themselves or someone they knew. We figured it’s worth sharing here, considering it’s our magazine and all. If you know anyone in the photo, you can reach Globe reporter Kathleen Kingbury here or let us know here.